SIAM exists to ensure the strongest interactions between mathematics and other scientific and technological communities through membership activities, publication of journals and books, and conferences. There are a wide range of corporations and institutions that employ applied mathematicians and computational scientists. On this page, SIAM lists some companies and institutions that have information about career, internship, or fellowship opportunities on their web site. There are a wide range of corporations and institutions that employ applied mathematicians and computational scientists. 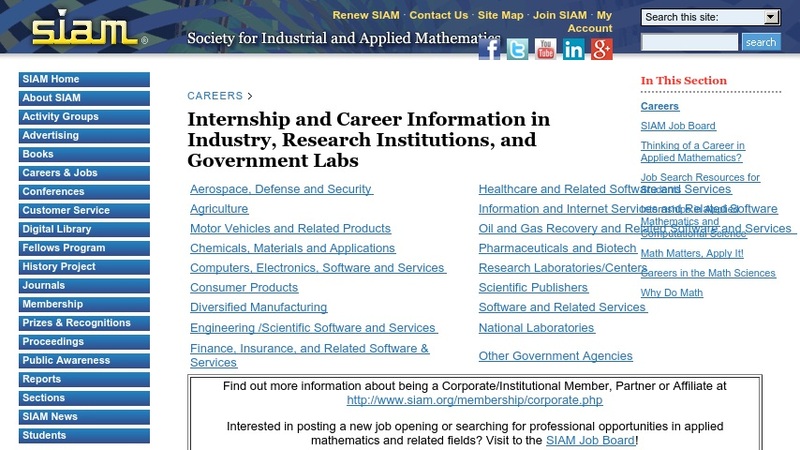 On this page, SIAM lists some companies and institutions that have information about career, internship, or fellowship opportunities on their web site.